What is DBT? 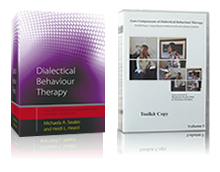 This one-day workshop is designed to be an overview of Dialectical Behaviour Therapy (DBT). Change-based technology (behaviour therapy) with acceptance-based principles (validation) are introduced with dialectical strategies (those that provide the balance of acceptance and change). The frame of DBT is highlighted and the modes and functions of comprehensive DBT are defined. Topics include: the diagnosis and bio-social theory of borderline personality disorder; DBT treatment targets and structure of treatment for multi-problem, high-risk clients, including the modes and functions of comprehensive DBT programmes. This training is intended for mental health professionals who wish to acquaint themselves with the DBT treatment or who are considering further training in DBT. After a DBT taster day, what comes next? If you have enjoyed this one day workshop you may want to know what is next for you in your DBT journey. Many clients spend more time with support staff than they do with their clinically licensed and trained DBT or non-DBT therapists. This training is designed for all clinical front-line support staff in a wide range of treatment contexts. Participants will learn the basic principles of DBT, and how to structure contact with clients around DBT assumptions, agreements, and targets. The role of front-line staff members in DBT programmes will be clarified, especially the relationship with the DBT team and the individual therapist. This two-day workshop covers the fundamentals of DBT Skills: Core Mindfulness, Distress Tolerance, Emotion Regulation, and Interpersonal Effectiveness. Participants learn how to set up a group, the group goals and guidelines, begin to teach skills, be a co-leader, identify and solve common problems in skills groups, make skills lectures come alive, give meaningful homework assignments, and review homework assignments in a way that promotes active engagement with different client populations and settings.This course is designed for all mental health professionals who want to learn to teach or improve their teaching of DBT skills to clients. With suicide among the top ten causes of death nationwide, the responsibility for careful assessment can be a source of extraordinary stress to clinicians. Recent studies on suicidal individuals indicate the DBT® protocol for assessing and managing suicidal behaviours is a critical component in effective treatment. This training teaches how to recognise risk of suicide, use specific strategies for management of high risk situations and care for clinicians’ own distress and well-being while working collaboratively with clients to build a life worth living. The training is not specific to DBT, but a background in behaviour therapy is recommended. This two-day workshop covers the modifications made when applying Dialectical Behaviour Therapy (DBT) to clients with Borderline Personality Disorder (BPD) and substance use disorders. Participants specifically learn how DBT, when applied to populations with co-morbid disorders, differs from standard DBT for BPD clients in the way that DBT is targeted, how behavioural skills are taught in skills training group, how to engage clients in therapy at the beginning of treatment, strategies for not losing clients during treatment, and how therapists are supported when clients are in danger of dropping out of therapy. Mental health professionals working with suicidal adolescents with multiple problems are often stymied by complex clinical presentations and challenges that arise during treatment. Learn how to apply comprehensive DBT to an adolescent population to engage and retain clients. This training covers how to convey the bio-social theory of DBT to adolescents and families, describe dialectical dilemmas relevant to adolescents and families, and structure and run multi-family skills training groups. This workshop is appropriate for experienced individual psychotherapists with solid familiarity with DBT. Participants will advance their ability in specific principles and strategies relevant to skills training and coaching with adolescents and families, individual therapy, family sessions, and managing communication and coaching outside of session (e.g. phone calls, emails and texts). Specific attention will be paid to teaching adolescents and families the skills of dialectics, validation, and behaviour change (the “Middle Path”). After attending any of the workshops above to continue your DBT journey you need to either join an established DBT team within your trust / organisation. Ask around to see who is delivering locally and whether you can join the team. A 5 day foundation training will equip you to start working with clients when you have a trained team around you. If there is no team in your service, then why not form one yourself? You need at least 4 people to apply for DBT Intensive training, one of which must be a clinical psychologist. All members must already have a core professional qualification such as nursing, social work, occupational therapy, psychological therapist, or psychiatrist. Your new team would attend 10 days of training in 2 five-day blocks, separated by 6 months to work on setting up your service and working through some homework assignments. Once you have completed intensive training you can call yourself a DBT practitioner. You may then work towards accreditation in this fascinating therapy.